How much is your tattoo fading? Do you think you’ll have to have it done over again? 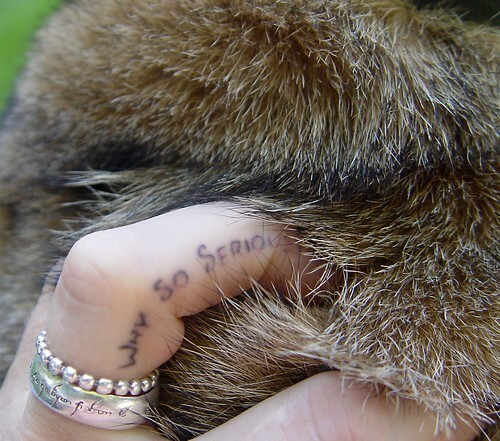 Is that tattood to your finger? Cool!! So when are you going to show me a picture of the whole dog? I LOVE the furry moth. I was looking for a furry caterpillar, but coudln’t find one anywhere around here. Oooh, moths. Not my favorite. But good shot. Owww! A furry moth!!! I’ve never seen one of those. Very cool. LOL! GREAT photos! Love the moth. Looks like he’s hanging on for dear life. I also did Photo Hunters. I hope you get a chance to visit! that furry moth looks a bit like an alien. 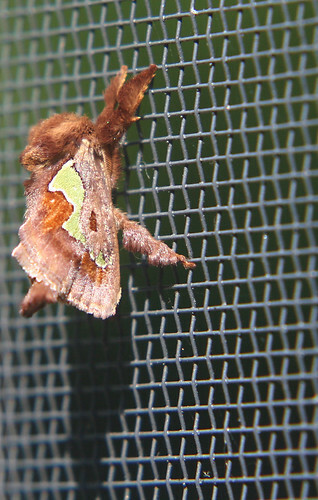 THe moth pic reminds me of one of the stories in Robert Fulgham’s “Everything I Needed to Know … Kindergarten” as it looks like a teddy bear with wings. Perfect pix! You are so good at presenting interesting and eyecatching pix. Shiba has beautiful furry and the moth is very cool. Nice choices for this theme. Have a great weekend.